At 24, how do you succeed in playing varied characters so spontaneously? Well, I don't read the newspaper. But when I played the riot victim in Dev, I could feel the character's pain. When the camera is switched on, I just do what comes naturally to me. My roles next year display the same range as the ones this year. Shyam Benegal has offered me a film. I'm still reading the script. 2006 started with me playing mother to two children in 'Bewafaa'. Soon, I'll be seen as a college student with Shahid Kapur in Milenge Milenge. But aren't Hindi heroines supposed to dance around trees? That's for those who like to play safe. I don't have the top banners with me, but I'm looking for the right roles with talented filmmakers like Govind Nihalani, Sudhir Mishra, Shyam Benegal, Abbas-Mustan, Ken Ghosh and Satish Kaushik. I don't want to do only candy floss roles. Doesn't it bother you that playing a mother, prostitute or a vamp can erode your popularity among the youth? Not at all. The audience knows that every role of mine is trying to pass on some message or the other. So many college students SMS me about my films. They want to know about my next role. I'm definitely going to keep the young audience in my mind. I'm the only major actress who's a part of the younger generation and yet plays mature roles. People accuse you of being money-minded? Money is as important to me as any professional. I feel my talent and hard work deserve to be compensated for. I suppose filmmakers pay me my price because they think I'm worth it. Offbeat directors can't afford my commercial price so I'm flexible with them. 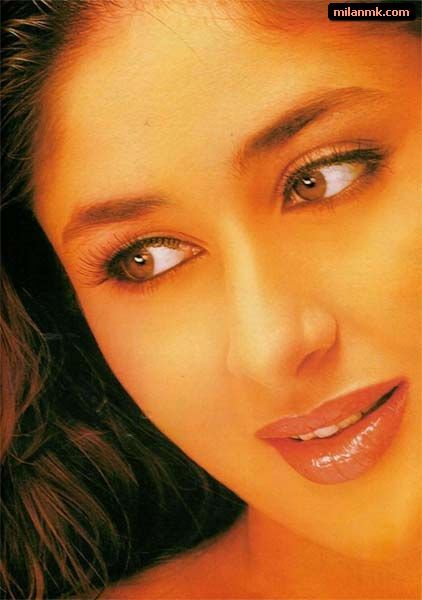 Were you hurt when people commented on the missing chemistry between you and Shahid in Fida? No, because we weren't supposed to be compatible at all. I played a negative character. The film didn't work but I don't regret doing it. All major actresses have given flops. My hits are mine. Whether it was Mujhe Kucch Kehna Hai, where no one thought I could give a hit with a director like Satish Kaushik, or Ajnabee, where my co-stars were Akshay Kumar and Bobby Deol, I did it on my own. Even in Karan Johar's Kabhie Khushi Kabhie Gham, my character was appreciated on its own steam. And, I'm sorry, but there isn't a single Khan in Hulchal. Just goes to show that I don't need to depend on other factors. Ultimately, no one makes a film succeed. Only the script runs. You are a rare actress today who flaunts and celebrates her love for her man? I celebrate love. The audience enjoys watching the lead pair celebrate love. But, in real life, I'm sorry to say that our actresses don't have the dignity to own up to a relationship. Don't we actresses have the right to love? I've a great support system in my family and friends. For those who think love is a hindrance to a career, here's news; I'm doing my best work now when I'm in love. What's life without love, yaar? It's so lonely at the top. I'm so lucky to share my successes and failures with someone.